The Uttar Pradesh government’s move to shoot off a letter to the ministry of information and broadcasting, requesting it to get the censor board to defer the release of Sanjay Leela Bhansali’s movie Padmavati, is an unwelcome development that has grave consequences for democracy. We shall presently come to the ridiculousness of the excuses put forward by the Yogi Adityanath government in justifying its move but first, let us understand why actions such as these undermine India’s strength as a democracy. The Central Board of Film Certification (CBFC) is as an autonomous body under the I&B ministry. The UP government’s move amounts to blatant interference with the workings of an autonomous institution and gives us a fair idea why even seven decades after Independence, India’s economic or regulatory institutions remains weak and ineffective. While rejecting a plea to stay the release of Padmavati, the Supreme Court had recently observed that the CBFC is well equipped to take an informed decision based on existing guidelines. While the highest court of the land refuses to interfere with the proceedings of an autonomous institution and reposes faith in its decisions, it is regrettable that a state government tries to worm its way into undermining the CBFC’s autonomy. Simply put, the UP administration has no business telling the I&B ministry to influence the decision of the Prasoon Joshi-led board, where the movie has recently been submitted for certification. The reasons that have been cited to justify the letter indicate that the state government is trying to abdicate its responsibilities by taking recourse to amorphous “public sentiment” and indulging in blackmailing tactics to have its way. The two-page letter which UP principal secretary (home) Arvind Kumar wrote to Union I&B ministry secretary NK Sinha — a copy of which was marked to CBFC CEO — argues that the film’s re-release on 1 December will clash with civic poll duties and Muslim festival Barawafat and hence it will be difficult to arrange for security. “In view of the civic polls, polling for which is scheduled on November 22, November 26 and November 29 and the counting on December 1, and also the ‘Barawafat’ procession by Muslims on December 2, the film’s release can pose serious security issue,” reads the letter. 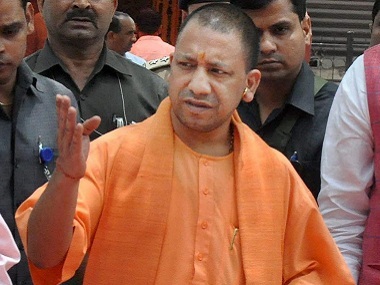 Lest it needs to be reminded, the Yogi Adityanath government was elected into the office not to portray helplessness when faced with violent threats from fringe groups. It is the duty of the state to maintain law and order and see to it that motley groups are not allowed to indulge in violence or arson. It is incumbent on the state to ensure smooth passage and peaceful screening of the movie upon CBFC certification. Just as peaceful protesters have every right to air their grievance, those who want to watch a duly certified film have every right to do so. The state cannot give in to intimidation and threats from fringe groups because that incentivises violent behaviour, lowers the bar for imagined grievances and paves the way for repeated instances of violence. It’s as if CBFC chief Joshi has outsourced his job to the principal secretary. Will every movie now be sent to the UP government offices for certification and clearance? On what basis has Kumar reached a conclusion that the movie “distorts historical facts” when even the CBFC chief has not yet watched its screening and is yet to take a call? It is also interesting to note the correlation between “fictional stories” and creation of “vicious atmosphere in the nation and society” that “develop social hatred.” Is this backed by professional assessment, or is it a fruit of the principal secretary’s fertile imagination? The letter goes on to point out that “the film has shown a ‘Ghoomar dance’ by Rani Padmavati and her love affair with Allauddin Khilji, which is not mentioned in any history book.” This is in direct contradiction to Bhansali’s statement where he has categorically stated that there is “no romantic scene or song or dream sequence between Rani Padmavati and Allauddin Khilji”. The filmmaker had also uploaded a video statement on Twitter to clear all doubts. It is one thing when uninformed or misinformed protestors indulge in violence, and quite another when the principal secretary of a state government takes a stance that is misleading and runs contrary to facts. This writer had criticized actor Deepika Padukone for calling an entire nation “regressed” for the action of a few while noting that the Centre, states, judiciary and the larger public have come out in support for creative freedom. This act from the UP government, however, blatantly violates those norms and raises questions about the trajectory of our democracy.